The two of us ordered three Lunch Special rice plates and each came with a complimentary bowl of soup. 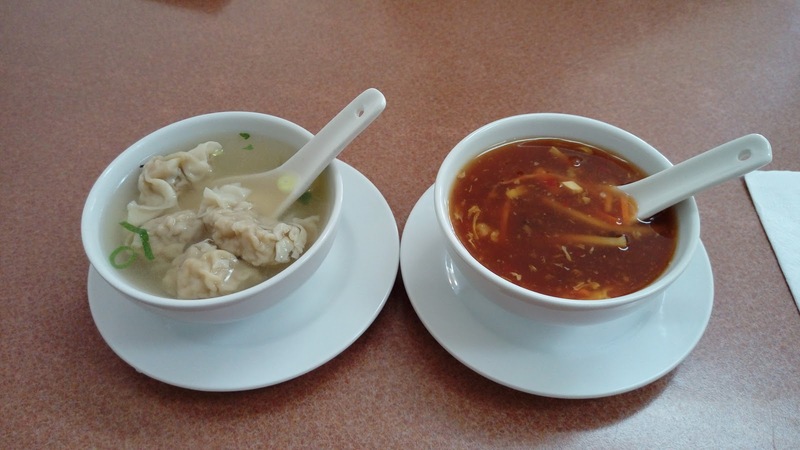 With only two options, we opted for two bowls of wonton soup and one bowl of hot & sour soup. The Wonton Soup 云吞汤 has always been my priority choice. Served in pork bone broth, each bowl had four small yet plump wontons. The filling was pork, nothing but pork, and it was seasoned mildly with salt and pepper. Unless it's my vegetarian day, or else I usually would not order the Hot & Sour Soup 酸辣汤. However, I did order one this time just so Buddha Boy could have a taste. Thickened with corn starch, the soup had very limited julienne cuts of canned bamboo shoot, carrot, tofu and black fungus. Oh, egg was there too, but it was pretty hard to detect. Buddha Boy ordered two items from the Lunch Special menu. The first was Chicken with Chinese Mushroom & Bamboo 双冬鸡肉. Flavor was predominately sweet bean paste. Generous amount of tenderized chicken with onions (lots of it) and green/red bell peppers acting as fillers. Honestly, we love onions, but it was a bit overwhelming. The iceberg lettuce salad was lightly drizzled with a sweet and tangy dressing. 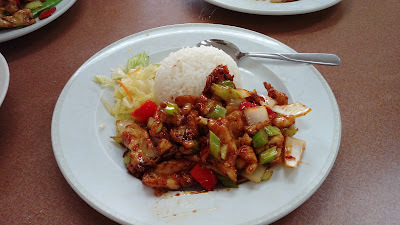 Buddha Boy's second plate was Chicken with Satay Sauce 沙爹鸡肉. Yes, the dish looked similar to the previous. 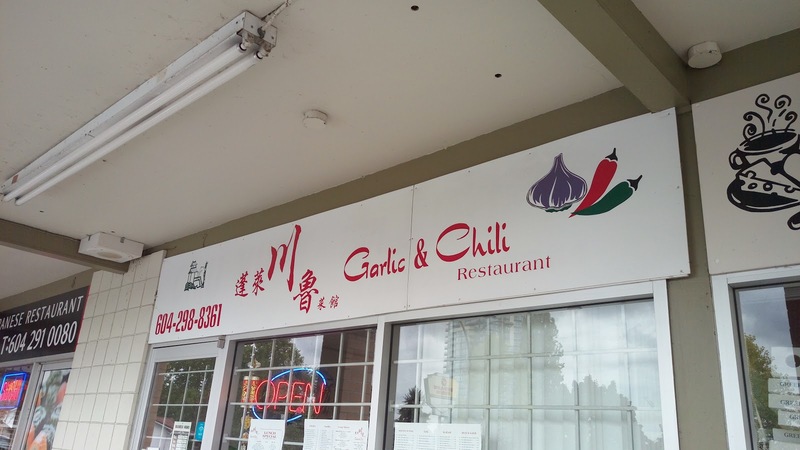 Flavor was the Cantonese-style satay sauce. Again, the plate had a considerable amount of tenderized chicken, a reasonable portion of green/red bell peppers and a massive load of onions. 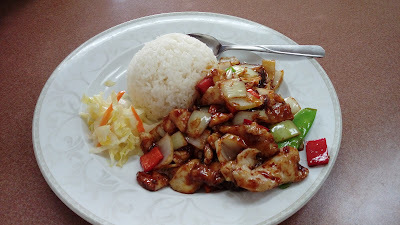 I had my usual Lunch Special of Diced Chicken with Chili & Garlic Sauce 渔香鸡丁. The garlicky soy mix had a nice spicy kick. 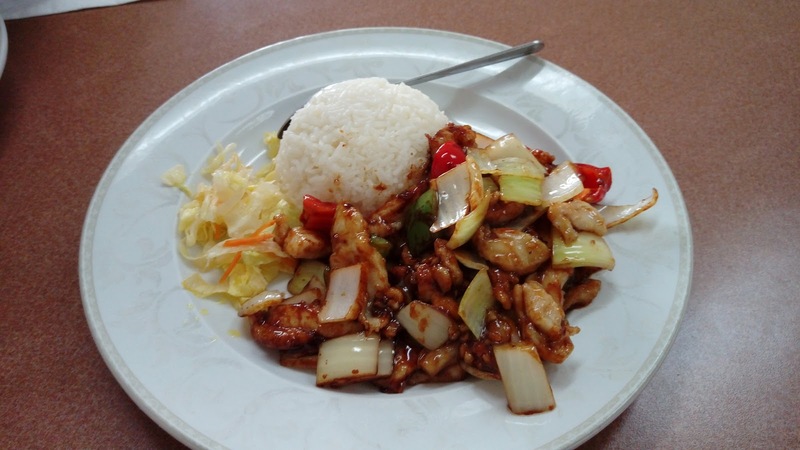 Similar to the previous two dishes, plenty of tenderized chicken with identical fillers. Yes, by now, we've realized that all the Lunch Special chicken dishes used the same ingredients with only the flavoring agents being different. 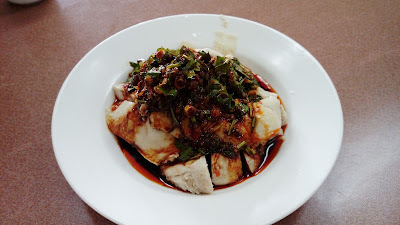 One of my favorite dish here was the Drunken Chicken with Homemade Chili Garlic Sauce 口水鸡, aka saliva chicken. While not authentic, Buddha Boy and I have always enjoyed this cold dish. Unlike the classic version where only green onions are used as the refreshing element, the version here used a lot of cilantro to balance the spiciness. This version was also a lot less oily than the classic version. We also had three orders of Crispy Spring Roll 炸春卷 (one roll per order). 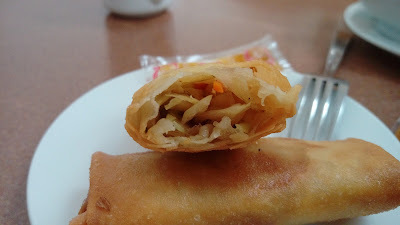 The meatless spring rolls had only cabbage and carrots. The stuffing was lightly seasoned white pepper. 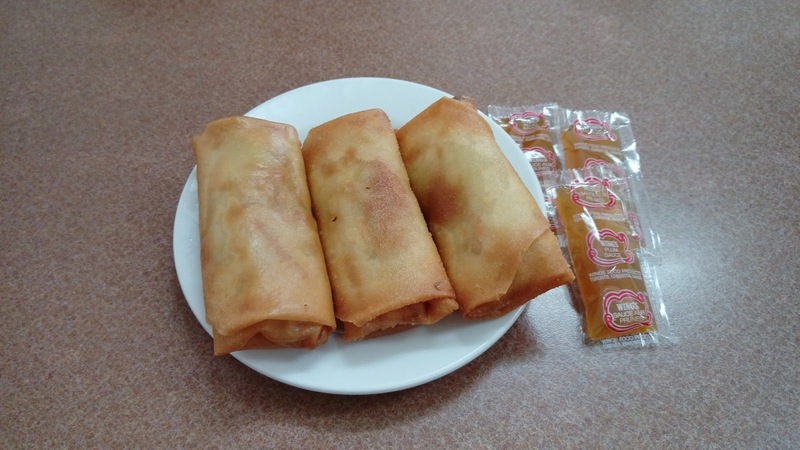 While these were nicely deep-fried with crispy outer coats, the rolls, as a whole, were not too satisfying. Most likely not a repeat for us. With six tables, twenty-two seats and only one man in the kitchen, this clean yet divey joint is not meant for large groups. Price points can be a bit high if ordering off the regular menu. The Lunch Special menu is a much better bang for the buck and it runs daily from 11am to 4pm.